A farmer in Perthshire has had to use the last resort by shooting a dog dead following a livestock worrying incident on his farm. Police Scotland confirmed the incident happened in the Forteviot area on Sunday (15 April). The farmer and pet owner were described as "very upset". The farmer reported the incident to the police following the shooting. A spokesman for Police Scotland said: “Police Scotland can confirm they are aware of reports of gunshots in the Forteviot area earlier today. “Officers have carried out enquiries and confirm that the shots have been as a result of an animal being killed. Under the Dogs (Protection of Livestock) Act 1953, if a dog worries sheep on agricultural land, the person in charge of the dog is guilty of an offence. The Act considers sheep worrying to include attacking sheep, chasing them in a way that may cause injury, suffering, abortion or loss of produce or being at large in a field or enclosure in which there are sheep. To protect their livestock, the farmer has the right to kill the offending dog. Last month, a Cotswolds farmer shot a Husky dead after it chased and attacked dozens of sheep, killing one lamb in the process. A Welsh farmer shot a dog dead which ran havoc on his land and savaged six of his sheep last summer. And in June last year, a Wiltshire farmer shot dead a dog which ran havoc and savaged two of his sheep. The farmer said the whole incident had been 'deeply upsetting'. A further two farmers shot dead loose dogs attacking their livestock in 2017. A farmer from Aberdeenshire shot dead a dog which killed two of his sheep, and a farmer from Fife shot dead a loose dog which attacked his livestock. 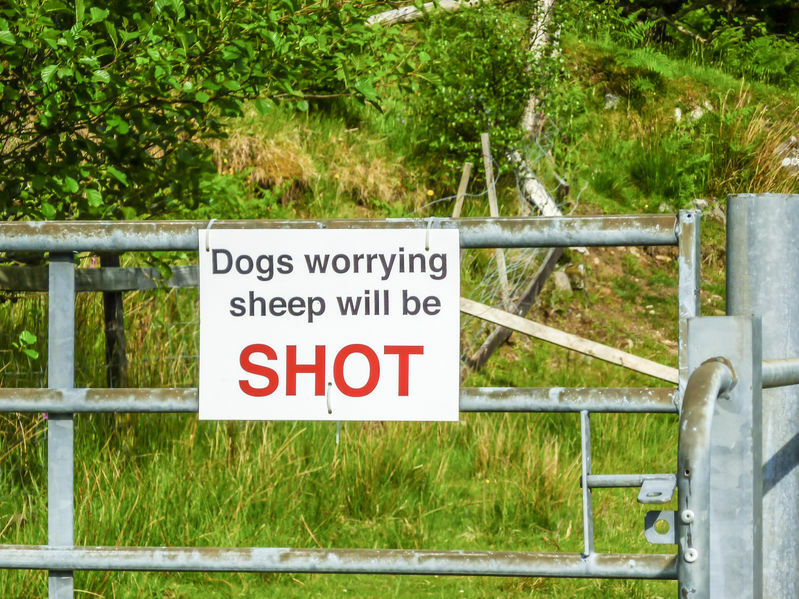 A farmer from Hertfordshire said due to the recent rises in sheep worrying cases, he said that he won't 'hesitate in shooting in future'.